I’ve been riding a road bike regularly for about seven and a half years, and I’m realistic enough to know that I’m definitely in the minority. I’d guess that only about 10 per cent of regular road bike riders in my own home city of Sydney are women. But that doesn’t hold me back. In fact it only encourages me to keep riding and attempting to get more women to join me on a women’s bike ride. It would also be unrealistic for me to think I could do all my riding in the company of women or that I’d actually want to. But I do see the benefits of female only rides, particularly for relatively new riders. My bike club LACC leads a weekly women’s ride which has been going consistently for over a year and I’m really proud of what we’ve achieved so far. Our numbers go up and down but we keep persisting and welcome new women on a regular basis. Decide on a start time, day and location and stick to it. Then turn up every week/month no matter what. You can make it weather dependant but make sure you make that clear to the riders. If you’re the ride leader make sure you have a couple of back up riders who can deputise, if you’re away or become ill. Communicating clearly is the most important aspect of starting a regular ride. Make it clear where the ride will go, the likely pace, what sort of bikes are acceptable, where information about the ride will be shared. For our regular LACC women’s ride we use our Facebook page to let riders know about the ride and to advise wet weather cancellations. On these posts we make it clear that it’s for women only, road bikes only, and other important details like start time and finish, location and topical information like road closures. 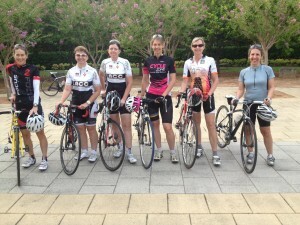 If the ride is for newish riders like the LACC Women’s ride then make sure you provide guidance about bunch riding, cornering or whatever is appropriate to your group during the ride. Our ride is a road ride so we make sure we call things like ‘clear’ at corners or ‘stopping’ at traffic lights. We also ride in bunch formation so make sure new riders understand what we are doing. Our ride is a no drop ride so we ride at the pace of the slowest rider. We nurture new riders so that they feel welcome and encourage them to return the following week. Make sure you end your ride at a local café. This serves a couple of purposes. The first is a caffeine hit to get everyone started for the day. The other is to provide the opportunity for social interaction. That’s not to say that we don’t talk while riding, but sitting down over a hot drink makes it easier to chat more freely and for the riders to get to know each other. I’ve often discussed other rides I’m planning at the post-ride café, and that’s led to others joining me for those as well. We also get to see what each other looks like with our helmets off! So what are you waiting for, go and organise your own women’s bike ride and let Women Who Cycle know about it.